Brushless Mechanical Sweeper features nonmarking rubber blades that effectively sweep up dust, debris and even semi-liquid debris from a variety of floor surfaces. It is perfect for foodservice applications. The low-profile design allows easy access around and under furniture. Tinted window allows you to see when the sweeper needs emptying. Soft rubber wheels glide easily on carpet, vinyl, tile, wood and more. This versatile sweeper also offers a wide, 7-1/2" sweep path with protective bumper, two debris canisters with one-touch emptying doors. It is made of durable galvanized steel and tough ABS plastic. 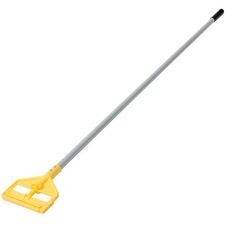 Mop frame is designed for use with Genuine Joe 02310 Dust Mop handle and 01702 mop refill (both sold separately). 360-degree swivel frame swings at all angles to provide the most versatile, efficient dust-control tool. 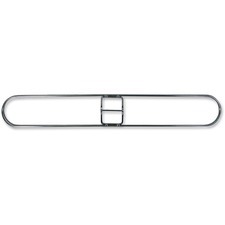 Frame is chrome-plated to resist rust and reinforced with 1/4" steel rod crossbars for maximum strength. Frame does not include attachment clip. 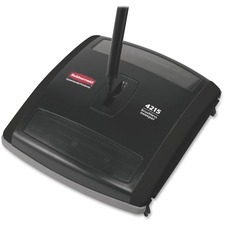 Brushless sweeper features a low-profile cleaning head to easily clean stairs, steps, grouted surfaces and more. Rubberized blade picks up wet or dry debris and quickly washes under running water. High-impact ABS body resists cracks and damage for lasting performance. Horse hair corner brushes clean close to edges for more thorough cleaning. Soft, nonmarking rubber wheels allow safe use on hard or soft surfaces. Space-saving construction hangs flat to store against a wall or behind a door. 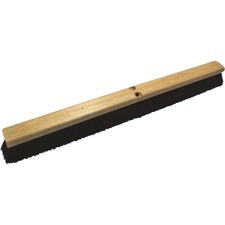 Genuine Joe Hardwood Block Tampico Broom - Tampico Fiber Bristle - 24" Overall Length - 1 Each Hardwood block broom features durable, Tampico fiber bristles that resist becoming rough from chemicals for long-lasting efficiency. Soft, natural fibers allow you to safely sweep smooth or rough floor surfaces. Sturdy hardwood block stays strong through daily use and is lightweight for effortless handling. 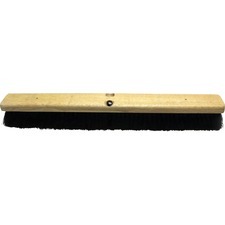 24" length covers a wide area for efficient cleanings while allowing easy maneuverability. 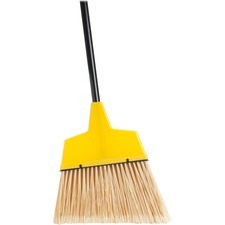 Angle broom features high-performance bristles to provide cleaning action. Flagged, acid-resistant, PVC bristles trap fine particles and will not stain, discolor or absorb odors. Use wet or dry. It is ideal for use in malls, restaurants and lobbies. Lightweight design features a durable frame and solid broomhead construction. The 47" handle is made of plastic. The head is made of polypropylene. Unger 16" EZ Flat Mop Holder - Pivot - Red Flat mop holder features a pivoting, low-profile head that reduces the need to bend and reach for areas to prevent lower back injuries. The large 16" surface provides more direct cleaning contact and scrubbing pressure for excellent hygienic results. Easy-to-use design collapses with the touch of a button to quickly rinse or change the mop when needed. Flat mop holder is designed for use with Unger nylon-threaded cone or tapered handles from 21-23mm in diameter and micromops (each sold separately). 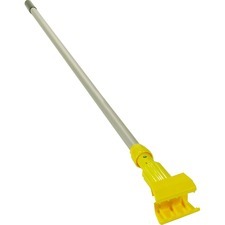 Invader Wet Mop Handle makes removing and replacing mopheads easy and efficient. 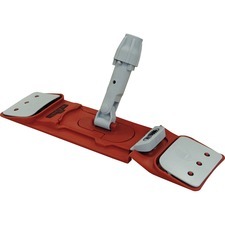 Side gate allows mophead to easily slide on and off handle. Thumb wheel clamps the mop firmly in place. It should be used with 1" (2.5 cm) headband mopheads only (sold separately). Large head of the frame is made of sturdy plastic. Handle is made of aluminum. 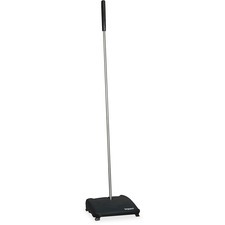 Gripper Wet Mop Handle makes removing and replacing mopheads easy and efficient. Jaws of the mop handle hold mopheads firmly. This clamp-style handle should be used with 5" (12.7 cm) headband wet mopheads only (sold separately). The head of the frame is made of plastic. The handle is made of vinyl-coated aluminum that makes it easy to clean. Impact Products Medium-duty Floor Sweep - Polypropylene Bristle - 1 Each Medium-duty floor sweep is tough enough for outdoor sweeping. Sturdy, hardwood block with 3" trim features long-lasting polypropylene bristles that can be used in wet or dry area to pick up heavy dirt. These water-resistant bristles are also acid-resistant. Handle is sold separately. The block is threaded to accept 15/16" diameter handles.